Color Wisdom Cards is an oracle deck and book set, created by psychic and intuitive Tori Hartman and illustrated by Gretchen Raisch-Baskin. There are 51 cards in the deck, measuring 3" x 4.5". The cardstock is flexible and shuffles beautifully. It's so important to have a deck that shuffles smoothly, and this one does so wonderfully. The texture of the cards is interesting, as the backs feel different from the fronts. The backs feel more matte, while the fronts feel more smooth and glossy. Another oddity I noticed in my deck is that one card was slightly larger than the others, so it would stick out from the deck a tiny bit. This card (Bronze God) also has a much glossier finish than the other cards, evenly very glossy on both sides. I don't know if this was just a fluke in my deck or if they are all like that. I ended up trimming it down so that it was the same size as the other cards, so that it wouldn't always be the card I cut to. But running through the cards with my hands, I can always tell which card is the Bronze God by the different texture. The deck and book came housed in a large box (the book is quite thick), but unfortunately the cards didn't come with a tuck box. It would have been nice to have a box for the cards themselves. I love the backs of the cards. I think they are gorgeous. (They are not reversible, but the deck isn't designed to work with reversals.) The image on the backs reminds me of a tarot combination of the Hermit and Eight of Cups. I love the cloaked figure and the rainbow colored hills. The cards are arranged in color groups: Red, Orange, Yellow, Green, Blue, Purple and Neutrals, with 6-9 cards in each group. There is a fable that goes with each card. The stories were told to Tori by different Spirits, and came to her in certain colors that served as backdrops to the stories. Each card has a theme, and the deck covers a wide array of emotions and experiences, both positive and negative. Some examples from each color group include: Truth, Insecurity, Joy, Guilt, Dilemma, Abundance, Growth, Grief, Impatience, Expansion, Forgiveness, Fear, Confusion, Destiny. I'm always happy to see a deck, such as this one, which features multicultural characters. There are also animals and inanimate objects that serve as the subjects of some of the cards. 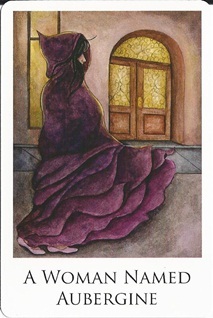 My favorite card, visually, is A Woman Named Aubergine (see image above). I love, love, love the artwork in this card. I love the color of her cloak, and how the folds look like flower petals. I love background as well. I wondered why I was so drawn to this card, and when I read the book, it seemed to appeal to my Scorpio nature. The quote is "You are not to know." It's a card of mystery. Aubergine is a combination of the higher consciousness of Purple and the earth energy of Brown, harnessing creative energy and using it to create the tangible. It's also about trusting in your intuitive powers. 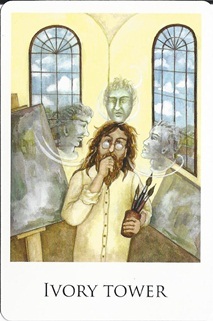 The character in the Ivory Tower card reminds me, visually, of John Lennon every time I see it (see image below). I don't know if the illustrator meant for the character to resemble Lennon or not, but when I read the book passage, it fit my image of him as well. The card is about self-awareness and enlightenment. "The Ivory Tower reflects the way we function in a world with values that are different from our own. While we might not fit into the world as it is, we are aware of it and accept the differences, for the differences also benefit us on some level." Does that not sound Lennon-esque? He even appears as an artist in the card. During my time with the deck, I had a character repeatedly appear to me. The Sky God appears in several cards in this deck, and he seemed to follow me around until his message was complete. I also had several instances of repeating cards, which is something I always enjoy experiencing with a new deck, as it makes me feel connected to it. When I first got the deck, the first card I drew was Sky Blue. I then let my daughter pick a card, and she selected the same one. Then my other two kids each pulled a card, and they both pulled Lucy from Indigo. So we had two repeaters for the first four draws with this deck. The card Honey Adams just came up for me yesterday. It would be too long of a story to write out here... I only mention it to say that it was an amazing, incredible moment of synchronicity, both with the name of the card, and the illustration on it. Penelope and Pickle is a card about grief, and the fable tells of a girl who is grieving over her dog's death. I drew this card the morning after having a nightmare about my family members dying, and a week after my aunt's dog died. Though I haven't worked with these cards extensively, or for a long period of time, when I have done readings with them, they have proven insightful... not to mention rather insistent! The book that accompanies this deck is a thick 394 pages! The cover is in color, while the inside pages are black and white. It begins with a Table of Contents, arranging the cards in color groups. The Introduction explains how Tori received the fables and developed the cards. The next section is on how to set Intentions with the cards, with exercises on how to manifest what you want. The Meditation section provides a few tips on meditating with the cards. The Fable Groups chapter details how you can use the cards in a group setting. The bulk of the book contains the card meanings and fables. They are grouped together by color. There is a black and white image of each card on its own page with the definition of the color. There is a keyword for each card along with a quote. The stories are very enjoyable to read. I love the idea of taking a fable and relating it to the experience in question. Each fable is followed by a section called Inspiration, which helps you relate the tale to your life. Following this is a Meditation which shows you how to work with the card in greater depth. Then there are two exercises, Connect With Yourself and Connect With Others, which gives you ways to be proactive with the advice you receive from the card, either by yourself, or with a group. In the back of the book are ten spreads along with sample readings. The book ends with a glossary of some of the concepts in the book, followed by an index in alphabetical order of card theme (Abundance, Acceptance, Balance, etc.). I have enjoyed working with the Color Wisdom cards and the stories that accompany them. It's a deck I'd like to get to know better if I had the time to devote to it. Since each card has a story to go with it, it's not a deck you can just throw down some cards and do a quick reading with. I'd love to become familiar with all the stories and know them at a glance when I turned over a card. I have a feeling this deck could become something of an old friend once you get to know it inside and out. I like that the deck covers a vast array of emotions, and doesn't shy away from the negatives, but rather addresses them honestly and helps you work through it. It's a fantastic resource if you are feeling stuck or down... pulling a single card and reading the accompanying fable provides a valuable, objective way to view your experience and will help you see it from another perspective, which is sometimes all we need to get unstuck or feel encouraged. I know I will continue to turn to this deck when I need to look at the bigger picture of an experience. 2016 Update: The Color Wisdom Cards appear to be out of print now. They can be found on Amazon for a high price. But there is another deck, a "second generation" deck titled Chakra Wisdom Cards which appears to be very similar to this deck, using many of the same images. I haven't seen this edition for myself, so this review does not address that edition at all. This deck review was originally published on my previous blog (Tarot Dame) on 2/3/13.